LYNfabrikken designed the YouMay furniture in collaboration with Austrian design studio Walking Chair. 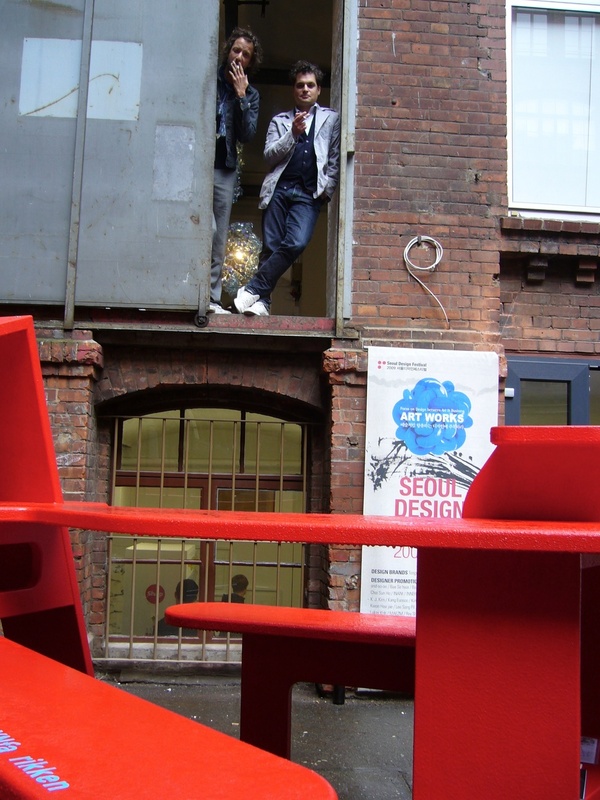 The idea behind the furniture was to create a different piece of furniture especially for the urban space – a sort of alternative to the classic park bench that invited people to use it and thereby the urban space in a less conventional and more including way. 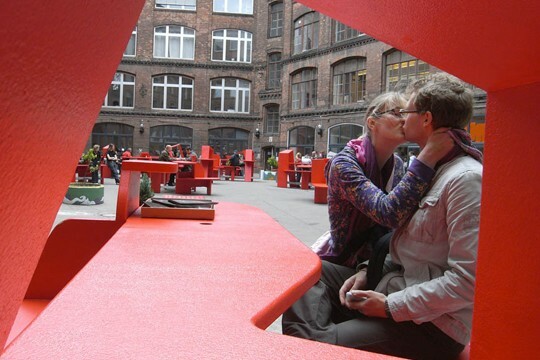 The project was very much an experiment based in the quite bold hypothesis, that a piece of specially designed furniture can boost networks and chance meetings in the urban space. And the design was developed with this hypothesis in mind. The key feature of YouMay is the low work surface inviting people to use the furniture in a different way than the classic bench does. You need to be able ti bring out your things and put them down to present your work to people. Besides that the seats are high, and not all of the seats are actually seats, some are meant for leaning against while standing, but they are all at eye level which encouragess people to talk at the same level – to meet at the same level. Most editions of the YouMay comes in intense powerful colours which make them stand out as visual magnets in the urban space. YouMay also expresses the hope that creating low zones which people can use on their own terms– whether for meetings, socialising or concentration will be a priority in future planning of urban spaces. 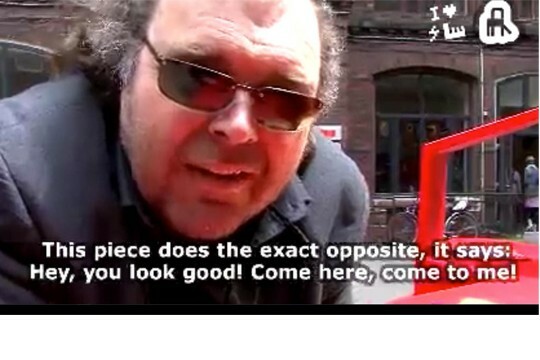 YouMay was first presented at MAK Museum in Vienna as part of an exhibition curated by Ron Arad. 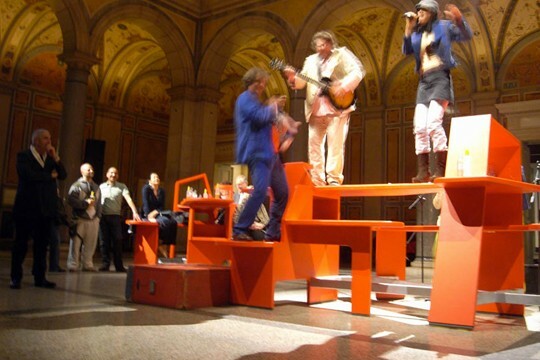 The MAK is a museum and space of experimentation for applied arts at the interface of design, architecture, and contemporary art, thus it was the obvious place for introducing the world to YouMay. At the presentation happening the YouMay proved its worth as both technical head quarter and stage as well. 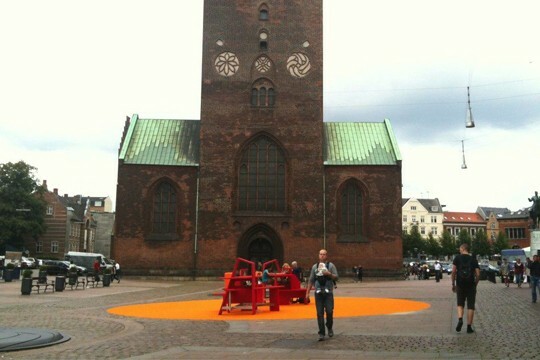 The furniture had its debut in Denmark during Aarhus Festival. The Mayor held a speech and the very special YouMay song was preformed as part of the celebration. Aarhus Festival were instrumental in the realization of YouMay and at the festival of 2009 a red line of YouMay’s made its way through the city creating little pit stops all through the festival. 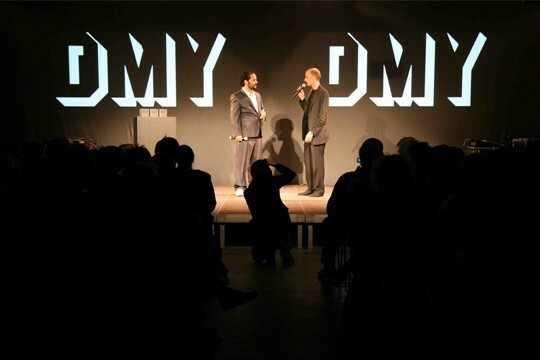 In 2009 YouMay was awarded a DMY award at Berlin Design Week by a jury consisting such prominent names as Jurgen Bey, BLESS Ines Kaag & Desiree Heiss, Jürgen Mayer H., Jerszy Seymour and Kyoka. 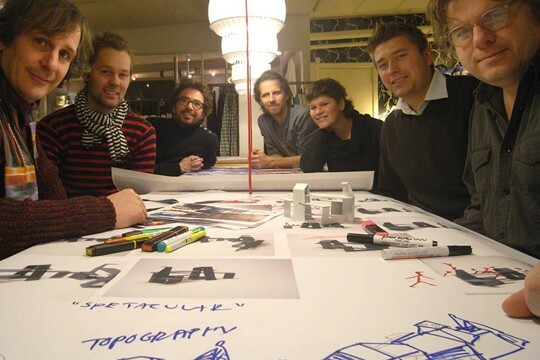 As part of this great honor YouMay got to travel Europe visiting other design festivals and conferences. When YouMay was featured at Ars Electronica in Linz, Austria, it was also the premier of the black and the wooden editions of the furniture. Since then the color scheme of the furniture has expanded considerable, but its clean and strong expression is maintained. Ars Electronica is festival celebrating and showcasing art, technology, society. Since 1979, Ars Electronica has sought out interlinkages and congruities, causes and effects. The ideas circulating here are innovative, radical, eccentric in the best sense of that term. A great home for YouMay. YouMay has traveled the world and visited many exciting places such as London design festival, the IKEA Phenomenon Exhibition at the Furniture Museum in Vienna, Salone di mobile / Zona Tortona in Milan and the Bauhaus Museum in Berlin. At Karls Platz YouMay set the scene of the so called “The Vienna Knowledge Space”, which was also the presentation of the blue edition. This project really in captured the very special potential YouMay contains, when it is use in a hub to created an alternative space within the urban space. Paired up with free WIFI and even a fixed concept as in this case, something really special emerges around and in-between YouMay.